What is “Confined Space Entry”? OSHA defines this as any area in the workplace that “Has a limited or restricted means of entry or exit.” This definition applies to drainage pipes, sewers, or even underground vaults. Entry and exit into these spaces can be difficult for many workers, and so OSHA Pros, the nation’s leading training and compliance experts, now offers an On-Site Confined Space Entry Training Course, designed to address these concerns. 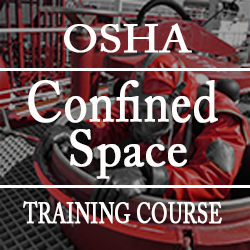 OSHA Pros OSHA-authorized Trainer conducts the on-site confined space entry training for your entry supervisors, entrants and attendants. Specialized training for confined space rescue teams is also available. Training materials include a training manual, plus a free model written confined space entry program on CD-Rom that you can revise for your company’s use. All training is documented and certified per OSHA regulations, plus each trainee receives a certificate of completion for the course. Also, this course can be customized for our customers regulated by Cal/OSHA safety orders. Money Saving Tip! Consider incorporating Confined Space Entry Training as part of an OSHA 10 or 30 Hour Safety Course or Mock-OSHA Inspection.